Native American clothing prior to the arrival of Europeans was different depending on the tribe and the climate where the tribe lived. However, there were some general similarities. What materials did they use? The primary material used by Native Americans in their clothing was made from animal hides. Generally they used the hides of the animals they hunted for food. Many tribes such as the Cherokee and Iroquois used deerskin. While the Plains Indians, who were bison hunters, used buffalo skin and the Inuit from Alaska used seal or caribou skin. Some tribes learned how to make clothing from plants or weaving thread. These included the Navajo and Apache, who learned how to make woven blankets and tunics, and the Seminole of Florida. How did they make the clothes? All of their clothes were made by hand. The women would generally make the clothes. First they would tan the animal skin. Tanning is a process that would turn the animal skin into leather which would last a long time and not decompose. Then they would need to cut and sew the leather into a piece of clothing. Often times clothing would be decorated. The Native Americans would use feathers, animal fur such as ermine or rabbit, porcupine quills, and, after the Europeans arrived, glass beads to decorate their clothes. What clothing did the men wear? 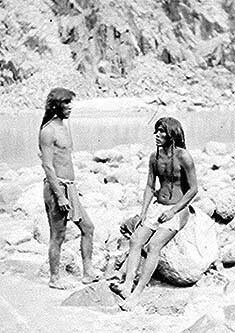 Most Native American men wore a breechcloth. This was just a piece of material that they tucked into a belt that would cover the front and back. In many areas, especially areas with warm climates, this was all the men wore. In cooler climates, and in the winter, the men would wear leggings to cover up and keep their legs warm. Many men went shirtless throughout much of the year, only wearing cloaks when it got very cold. The Plains Indian men were known for their elaborate and decorated war shirts. What clothing did Native American women wear? The Native American women generally wore skirts and leggings. Often they wore shirts or tunics as well. In some tribes, like the Cherokee and the Apache, the women wore longer buckskin dresses. Most Native Americans wore some kind of footwear. This was usually a shoe made of soft leather called a moccasin. In the cold northern areas like Alaska, they wore a thick boot called a mukluk. When the Europeans arrived many of the American Indian tribes were forced into contact with each other. They began to see how others dressed and took the ideas that they liked. Soon many tribes began to dress more alike. Woven blankets, fringed buckskin tunics and leggings, and feather headdresses became popular among many tribes. Prior to the Europeans arriving, American Indians used wood, shells, and bone to make beads to decorate their clothing and make jewelry. Later they would start using the European's glass beads. The brain of the animal was sometimes used in the tanning process because of its chemical properties. Plains Indians sometimes wore breastplates made of bone for armor when going to war. The most popular kind of headdress was not the feathered one you see on TV a lot, but one called a roach. The roach was made from animal hair, generally stiff porcupine hair. Elaborate clothes, headdresses, and masks were often used in religious ceremonies.